rec. November 2011, Sala di S. Maria della Carità, Chiesa di S. Francesco, Padua, Italy. I have to admit approaching this release already primed by Maurice Steger’s remarkable Harmonia Mundi disc (review). However with an almost entirely different collection of chamber works there is not really much comparison to be made between these discs despite the ‘concerto’ nomenclature for most of the pieces. Maria Giovanna Fiorentino has made a few recordings on the Tactus label though this is the first to cross my path. Her performances with I Fiori Musicali are apparently based on much research, and she has made a selection of less frequently performed though by no means unknown works by Vivaldi. There is a spare quality to the Concerto RV 103, in particular in the Adagio second movement where the harpsichord continuo is absent. The bassoon against the recorder is an interesting conversation, and with clear left-right definition in the recording this quality is nicely emphasised. There are a couple of moments in the opening Allegro where the technical demands force a minor drop in tempo, but as with most of the other performances on this recording the playing is good. 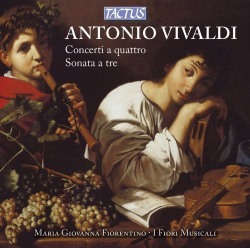 The Mediterranean feel of RV 84 is raised with the introduction of baroque guitar into the colour of the continuo, rousing dance rhythms in the outer movements contrasting nicely with the ‘great aria’ of the middle movement, the melodic elaborations of which are carried along by a thrumming accompaniment. The concertos in this programme are divided by the Sonata in A minor RV 86, which offers a contrast in structure rather than of content, the slow opening movement almost suggesting a kind of overture in its theatrical elegance. There might be something to be said for having the bassoon a little lower in the recorded mix in this piece. There is something restless about the slower movements in this sort of chamber music setting in any case. However the leathery rumbling bass in the Largo of this sonata runs roughshod over the cantabile suggested by the marking and is generally louder than the recorder throughout this whole piece. RV 96 is sweetly melodic, and as the booklet notes suggest, should be ‘rich in contrasting shadows and lights’. By this point in the listening session I was however beginning to doubt if these or many other contrasts would be in evidence. There is something about the recording or the performance which exposes accompanying lines at the expense of the recorder, and the violin sticks out equally whether playing counter-melodies, a solo line or a rhythmic background. The bassoon is a little lower in the mix in this piece which helps, but there is a general flatness of dynamic here which becomes a little wearing after a while. A welcome change is the Largo of RV 100, which is another toothsome duet between the bassoon and recorder. I'm not sure how much we should expect, but Paulo Tognon’s fagotto barocco doesn’t have a great deal of dynamic contrast on offer. He has a fine sound and intonation is mostly good, but if this instrument was a bicycle you’d think it only had one gear. RV 91 is a good concerto with which to end, with typical Vivaldi rising scales in the opening Allegro, and a rousing finale, ‘reminiscent of Autumn and the hunt’. Violinist Dario Luisi barely copes with the scary heights of this movement however, so we are left biting our nails rather anxiously. The guitar also needs tuning. This is an attractive prospect and reasonably enjoyable, though if you already have a truckload of Vivaldi concertos and chamber music I wouldn’t propose it as a supplement, any more than I would particularly as an entry into this world. As previously mentioned, the overall texture is a bit samey and abrasive after a while. Also there are one or two technical issues which leave me fairly sure I won’t be playing it very often in the future.